Getting and keeping your cholesterol levels in a healthy range can be a challenge. Phytosterols (a nutrient that looks like plant cholesterols under a microscope) are similar to cholesterol, but without cholesterol's harmful effects. 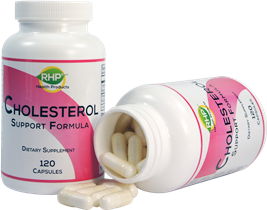 Phytosterols fill up the cholesterol receptors in the intestines and as a result, allows the high levels of cholesterol that you don't want, to be flushed out of the body. "I am so very pleased with the labs recently from my doctor that showed normal for cholesterol and triglycerides after several months of using the Cholesterol Support Formula. Yeah! I am so glad that I have this product!" † These testimonials are based on the individual experiences of these customers. Cholesterol is a waxy substance that floats around in your bloodstream. LDL cholesterol can build up on the inside of artery walls, contributing to artery blockages that can lead to heart attacks. Higher LDL cholesterol levels could mean a higher risk of heart disease. If you have high cholesterol levels, your doctor will most likely ask you to change your diet by eliminating fats from meat, fats from full fat dairy produce, eggs, some oils, store bought cookies, crackers and cakes. He'll also want you start exercising regularly in order to get your cholesterol into a healthy normal range. Plant sterols, also known as phytosterols (the plant’s cholesterol), are naturally-occurring substances that are found in fruit, vegetables, legumes, whole-grain products and most vegetable oils. 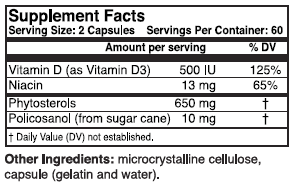 When you take phytosterols, the phytosterols fill up the cholesterol receptors in the intestines and as a result, allows cholesterol (the kind you don't want) to be flushed out of the body. To begin to see any benefits you need to get a minimum of 800 milligrams of phytosterols per day. While it may be difficult to get this amount of phytosterols naturally from heart healthy foods such as fruits and vegetables, it is very achievable if you include the RHP® Cholesterol Support Formula. We're so sure about the effectiveness of the RHP® Cholesterol Support Formula, that we offer a 90-day money-back guarantee on your initial order. A bottle containing 120 capsules is on sale for $26.70 (an 18 percent discount from $32.70)! Order your RHP® Cholesterol Support Formula below and experience the results for yourself! Order the RHP® Cholesterol Support Formula Now!